2 Wacky Dice Games: Guns and Monkeys and Bears, Oh My! Never bring a knife to a gun fight. Leave the gun, take the banana. Overview: Everyone knows monkeys love bananas. What you may not know is that in order to get bananas some monkeys resort to violence. Monkeys With Knives and Guns is exactly what it sounds like: a crazy dice game about getting the most bananas through the use of force. Rating: It pretty much is a barrel of monkeys … with knives and guns. (You saw that coming, right?) Not my favorite type of game, but funny and good for a quick filler game. Who Will Like It? Monkeys is a screw-your-neighbor game, and obviously involves a lot of luck. There’s some strategy involved in deciding which monkeys to fight and which bananas to steal, but it’s not very deep. If you’re okay with that, then you can pretty much decide if you like the game based on your reaction to the title. There’s not a lot to explain, really: the monkeys want to collect bananas, and they’re armed and dangerous (sometimes to themselves). 16 massive monkey dice, 30 cardboard banana tokens. 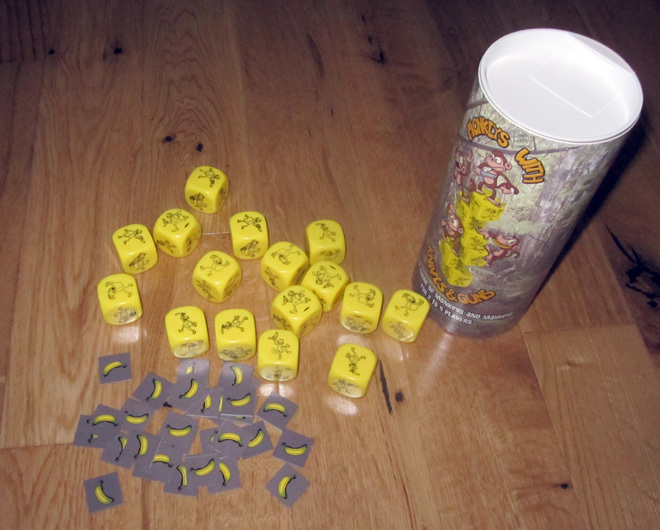 The game includes 16 dice and 30 cardboard banana tokens in a cardboard tube. 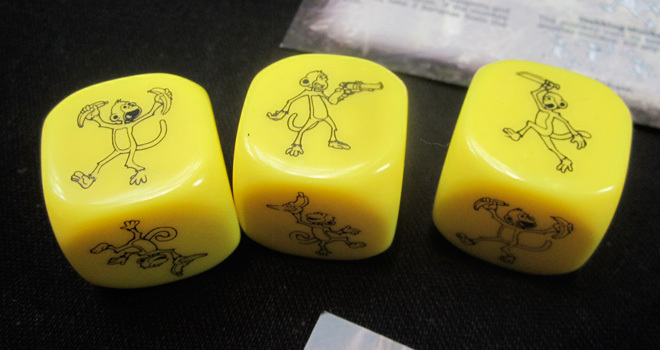 What really caught my eye at PAX was the dice themselves: they’re banana yellow and are huge, oversized dice. If you play a two-player game each person gets eight dice, and you’ll need two hands for that. 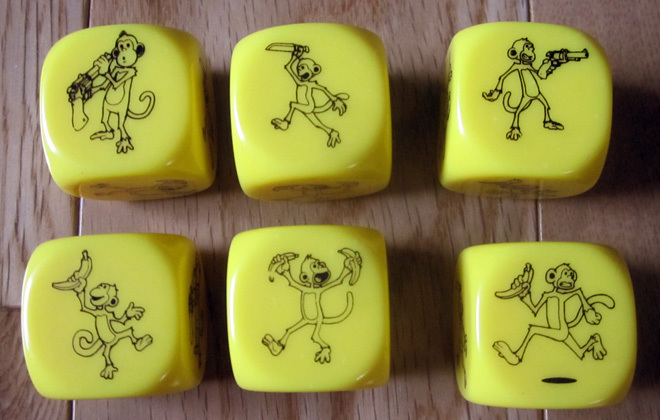 The artwork on the dice is fun: these are very exuberant monkeys. However, since the images are just printed on the dice (and not engraved), I did notice a range of print quality on the dice — there are some where the image is very light or has missing bits. The banana tokens are a little cheap. They’re just printed and stuck to thin cardboard squares, single-sided. While they’re simply counters for the score and you could use pretty much anything, it would have been nice to see something a little nicer—maybe thicker cardboard or double-sided pieces. I should mention that at PAX, where they were demoing the game, they had a tub of what looked like yellow plastic bananas. Upon closer inspection, I realized that they were, in fact, banana Runts. They told me we were welcome to eat them, but as they’d been handled by a lot of people that weekend we probably shouldn’t. Still, they did look the part. Stupid Monkey, Stabbing Monkey, Shooting Monkey, Hungry Monkey, Smart Monkey, Robber Monkey. Each player gets the same number of dice (8 in a two-player game, 5 in a three-player game, 3 in a four player game). I’m not sure why that’s not 4 in a four player game, but I suppose you could do whatever you want. Everyone rolls the dice together. You line up your dice, and then you take turns doing a Fight phase, and then a Take phase. During the line-up, you remove any Stupid Monkeys: these are the ones looking down the wrong end of the gun, and they eliminate themselves. Next, you separate your fighting monkeys (Stabbers and Shooters) from the taking monkeys (Hungry, Smart, and Robber). During the Fight phase, each player can use their Stabbers and Shooters to kill off other players’ monkeys. Shooters can kill anyone, and Stabbers can kill everyone but the Shooters. After everyone has used up their fighting monkeys, everyone takes a turn in the Take phase, grabbing bananas with whatever monkeys they have left. Hungry Monkeys get one banana from the pile, Smart Monkeys get two, and Robber Monkeys get to steal one (either from the pile or from another player). Then everyone gets their dice back, and starts over. The starting player rotates each turn. When somebody reaches the goal, the game ends: 15 in a two-player game, 10 in a three-player game, or 8 in a four-player game. Monkeys With Knives and Guns isn’t a deep game, nor is it intended to be. It’s really about bashing your opponents and getting bananas, so there’s no point in being civil about it. If you don’t steal from or shoot somebody else, eventually they’ll probably have to do it to you anyway. There is some strategy involved in which monkeys to kill: do you take out the robbers so they can’t steal from you? Or take out the Smart Monkeys to reduce the number of bananas they get? Or perhaps you kill off the fighters so they can’t kill your own Hungry Monkeys? It’s a pretty quick game, though, and probably doesn’t require too much analysis when you play. After all, these are monkeys, not master strategists. It’s a cute game and I’ll probably break it out from time to time, but for me it doesn’t beat Zombie Dice and I prefer press-your-luck games to screw-your-neighbor games. For the right crowd, though, I’m sure Monkeys With Knives and Guns would be a riot. Wired: Oversized dice are really fun, and the theme is ridiculous. Tired: Gameplay isn’t very deep, and heavily luck-based.